SILICONIX, represented by Braemac , has announced the release of the first two power MOSFETs to combine the extremely low Qgd values enabled by WFET technology with the very low rDS(on) values of TrenchFET Gen II technology. The two power MOSFETs are designed for low-side operation in synchronous buck (single and multi-phase configurations) dc-dc converters in notebook PCs, servers, and VRM modules, as well as in synchronous rectification in fixed telecom systems. The new Si4368DY (PowerPAK SO-8) and Si7668DP (SO-8) feature on-resistance of 3.6Ω (at 4.5V max) and a low rDS(on)-times-Qgd value of 23mnC for improvements of 25% and 54%, respectively, over specifications for competing MOSFET devices. 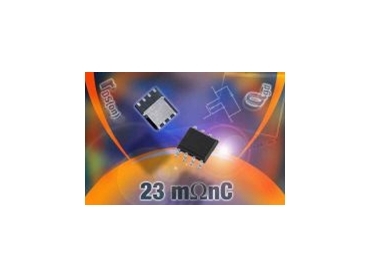 Both devices provide an exceptionally low Qgd/Qgs ratio of 0.37 to ensure high "shoot-thru" immunity and to help keep Qg in check for reduced switching losses and more efficient dc-dc converter performance. The maximum gate threshold voltage for the Si4368DY and Si7668DP is 1.8V. Packaged in the thermally enhanced PowerPAK SO-8 package, the Si7668DP also offers lower thermal resistance and greater power dissipation.